Diving Hol Chan Marine Reserve and Shark Ray Alley in Belize - "Our Belize Vacation"
The Hol Chan cut is only 15 minutes (4 miles) south of San Pedro and about 30 minutes north of Caye Caulker. Trips from San Pedro last about half day, while trips from Caye Caulker last a full day, including a visit to San Pedro. During the boat ride to the park, keep an eye out for jumping rays and flying fish. The Hol Chan Marine Park (Hol Chan is Mayan for Little Channel) is situated north of Caye Caulker. Declared the first marine park in the entire country of Belize, this area has been a protected zone area. Due to its protected status, what was once a depleted fishing area has now been allowed to re-generate, producing to divers and snorkelers alike quite a colorful and varied fish spectacle. Due to the protected status of the area, the fish populations have exploded. In waters as shallow as 5 feet, large schools of jacks, groupers, snappers and barracuda abound. Along each side of the cut grow healthy stands of corals and sea grass in shallow water, perfect for the beginner snorkeler. The more experienced swimmer can swim from one side of the cut to the other, experiencing shallow reef drop offs over the steep sides of the "cut", and sea grass and sand beds in the middle of the channel. Outside the barrier reef, the ocean bottom gently slopes off into the Caribbean. All levels of diving can be accommodated here due to the variations in depth, from 30 to over 100 foot dives can be planned and executed. Spur and groove formations (hills of coral running parallel to valleys of sand) provide rich habitat for marine life. Spotted eagle rays and other pelagic creatures swim above the reef while the more cryptic life like lobsters and eels fill the holes and tunnels through the coral spurs. The bottom composition in this area is mainly of coral canyons extending out like long fingers from the barrier reef. I prefer to refer to the coral composition in this area as "hard" corals, as opposed to "softer" corals such as sponges and gorgonians found along the walls on the outer atolls. This canyon phenomenon is caused by the motion of the water against the reef. Here you will find an abundance of HUGE fish. The Hol Chan dive is teeming with many of the fish overflow of the inside park and is colorful and highly interesting. It is not unusual in this area to spot schools of rays floating in the distance, or even schools of barracudas. The fish are pretty friendly and hang around out of curiosity. In fact, some are downright extraverts and may come right up to your mask to view you. Some of the fish are so friendly, they will stay around to be petted or may even come up and "kiss" your mask. In and around the Hol Chan Marine Park area, is "The Wreck". The wreck is really a sunken barge about 30 feet long located in approximately 80 feet of water. The main feature of this dive though, is not necessarily the "wreck" but the fact that on this dive you are GUARANTEED to see sharks. A colony of curious nurse sharks make this wreck their home, as well as a friendly green moray eel that lives in the front part of the barge. Please DO NOT try to touch or feed the eel. Remember they are wild animals and they could mistakenly take your finger as a piece of food. Nurse sharks are non aggressive sharks. They usually such in their food which primarily consists of crustaceans. Several sharks which we refer to as "grandpa-sized" sharks will circle you out of curiosity. They are just as curious about you, as you are about them. These are probably some of the friendliest sharks on planet earth, so enjoy them. There are not many places in the world, where you can enjoy diving with sharks circling around you. As always, remember o respect all wildlife as being wild. Move slow and do not use fast jerking hand motions. Remember too, you are in their territory. Enjoy your dive, and bask in the pleasure and enjoyment of being on the same level with these awesome creatures. SPECIAL NOTE: When trying to surface, do so "inside" the park area, where waters are calmer. This recently discovered dive site has been selected as one of the seven best "animal dives" in the Caribbean by SKIN DIVER MAGAZINE. For years, local fishermen cleaned their catch just inside the reef, to the south of Hol Chan Cut and Ambergris Caye. The fisherman soon noticed that the offal from cleaning fish was attracting nurse sharks and several Southern Sting Rays. When the dive operators of San Pedro found out, they quickly investigated. What they found was a bonanza, and "Shark-Ray Alley" quickly became a very popular dive site. The sharks and rays, hear the dive boats approaching and begin to school in anticipation of bait being thrown into the water. When you arrive, you will see the surface often boiling with rolling sharks and sting ray wings as they search for the scrapes. These creatures have a great tolerance for divers and snorkelers. The rays, which have a "wing-span" of two to four feet, swim directly towards the divers, mouths often turned up hoping for a hand held tid bit to be placed near their mouths. Others have learned to swim in circles around the divers, as if performing for food. 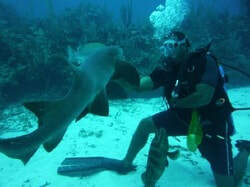 The docile nurse sharks average four to six feet in length and can be a bit more aggressive than the sting rays. It is important that you maintain your perspective. These are wild creatures first and as such, can be unpredictable in their behavior. The best course of action is to leave the touching and feeding to the dive masters, while you enjoy the show from a safe distance, determined by your swimming skill and comfort level. While much less visited, the sea grass beds of Zone B are well worth the visit if only for the novelty of what you might see. Sea grass beds are hugh feeding grounds, and chances are that youw ill come upon huge sting rays feeding on the bottom, and schools of parrot fish and hogfish grazing on epiphytes growing on the sea grass. Though a very rare occurrence, it is even possible to view manatee feeding in the grass beds. The best method of exploring the sea grass beds is to have your boat drop you off about 200 yards from the edge, and to slowly swim toward the center of the seabed area. Swim slow and swing your head from side to side. Much of the life in the grass beds is well camouflaged and cryptic, so you will have to key in on movement - a conch shell dropping as the snail reacts to your movement, a lizardfish darting to the surface to feed and then back down motionless, a sail fin blenny flagging. It is even worth your while to stop for a few minutes motionless and let the surroundings come alive. Within the sea grass zone lies the Boca Ciega ("Blind Mouth") cave. This "blue hole" is a miniature versions of the famed Blue Hole at Lighthouse Reef. You must be a cave-certified SCUBA diver to enter Boca Ciega, and only attempt to explore it after contacting the Reserve Manager at the office in San Pedro and securing an experienced cave-certified guide. The cave is considered dangerous, even by some experienced cave divers, and visibility in the area is generally poor. Finally while in the sea grass zone, keep an keen eye and ear out for passing boats. Since most snorkeling and diving actually take place at the Hol Chan Channel, many boats speed through the other parts of the park. You can hear the wine of an outboard motor from a long ways away. Rated the best animal dives in the Caribbean by Skin Diver Magazine.